You've won the job now make it pay! Management software to help you minimise risk and maintain profit on every job. Powerful tools in Enterprise Contract Management software allow you to price and track Variations, Dayworks and Valuations to maximise the profit on each contract. Contract Management integrates fully with other modules in the Enterprise business system, enabling information to flow smoothly between functions at the click of a mouse. At each stage, automated routines eliminate duplication of effort to boost productivity and increase efficiency. Or it can be used as a powerful stand-alone module in its own right. Creates Schedules of Rates automatically from the estimate, where one has been submitted to the client, ensuring complete accuracy of all quoted rates used when pricing Variations. Add any new items to the Schedule as Star Rate Items, allowing you to edit any of the values to arrive at the desired rate. These rates are automatically stored for use in subsequent variations ensuring that even additional items are only ever given one rate per contract reducing the potential for customer disputes and delayed payments. Automatically check all items entered into a Variation against the submitted Schedule of Rates; ensuring items are always priced at agreed rates. 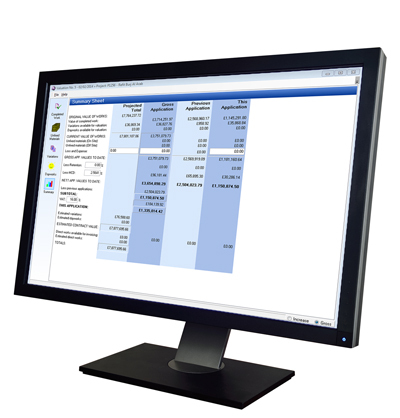 Employ user-defined adjustment tools to claim for indirect costs associated with Variations, such as any design, drawing or site establishment costs – as well as direct costs. Keep track of variations from initial budget entry through to getting paid for the additional work, using Contract Management’s Tracking and Status options. This is assisted by electronic posting of variations to the Valuations module, so that any additional works and changes to the contract are claimed for as early as possible. Update the estimated cost and revenue budgets, using dynamic links from Variations to Enterprise Contract Costing, ensuring you see an accurate picture of costs and profitability on the job at all times, taking full account of Variations. Automatically post material requirements arising from variations to Enterprise Procurement, to adjust the Master Buying List. Use Contract Management’s Dayworks tool to break each time and material Daywork down into materials, labour, sub-contract, plant and miscellaneous items, each of which can have a contract-specific uplift applied, ensuring maximum profit with minimal opportunity for error. Automatically link additional cost and revenue budgets from Dayworks to Enterprise Contract Costing to give a true and accurate picture of costs on the job at all times. As with Variations, material requirements for Dayworks are updated in the Master Buying List in Enterprise Procurement, while electronic posting of Dayworks to the Valuations module assists in claiming for additional time and material works as early as possible. Value completed work, unfixed materials, Variations and Dayworks quickly and easily to provide the basis for Applications for Payment or Sales Invoicing. Integrate with Microsoft Word to make use of user-defined templates for producing and presenting Applications and Invoices in any layout you require, using your own library of templates. Receive automatic warnings as each Valuation date approaches, prompting you to ensure Applications for Payment are submitted on time. Break down the contract sum by section and sub-section, even when the job has not been prepared using Enterprise Estimating. In fact, Valuations can even be detailed down to individual items where the contract is subject to measured work. Price and track Variations, Dayworks and Valuations to maximise the profit on each contract. For more information about Contract Management, you can request a demo or call 0800 028 28 28.